One, keep it short. […] Two, make it about something you care about. And three, don’t give advice. Ever. Nick Morgan also recently completed a 9-article series on speechwriting. In the series, he weaves through topics such as audience analysis, grabbing attention, speech development, concluding strong, and visual aids. Laura Bergells suggests three ways to close with a bang. James Feudo asserts that the only way to conquer public speaking fear is to get up in front of an audience and speak… often. Yes, books and other materials will help you improve your speaking skills and give you useful tips that will prevent your speech from being a disaster. But the only way for you to actually become comfortable speaking to groups is to actually speak to groups. There’s no way around it. Meryl Evans provides a tutorial to shrink your PowerPoint files. 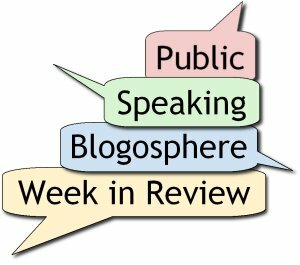 Olivia Mitchell reviews 13 of the best public speaking blogs. Lisa Braithwaite advises you to keep your cool when it appears that an audience member is attacking you with their questions. Terry Gault recently tackled this same issue which he refers to as dealing with the “stump the chump” dynamic. Lisa Marshall responds to the question: Do I mention I am pregnant when making a presentation? [Toastmasters] gives you the experience of a large variety of speaking styles […] The message is the one thing that separates professionals from amateurs. The professionals have spent days, months, and years working on one message. This can be one speech, one workshop, or one seminar. Jeff Bailey asks what barriers, if any, should be enforced when bringing new members into a club. The first school of thought is that you seek polished presenters and have entry requirements. The second school of thought is that you allow any person to join. […] there is a third option. You allow anyone to join regardless of their ability, but you make them show that they are serious. John Spaith provides advice in a pair of articles for incoming Division Governors and for incoming Area Governors. Even with 500+ TM’s to take care of, even if mostly you’re staring at Excel sheets, you’re never too important to pitch in. For speech inspiration, here’s an index card gem from Jessica Hagy. At first glance, this is a clever observation which provides public speaking humor. However, it is much richer than that; there’s a great lesson here for public speakers. Seek common elements among not-so-common concepts. 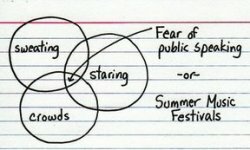 Most people do not view these two concepts (fear of public speaking and summer music festivals) as common. Yet, they share three elements (sweating, staring, crowds). In your speeches, look for opportunities to explain one concept in terms of another which is more familiar to your audience. Depending on the relationships you choose, this can enhance understanding, generate humor, or both! Jessica’s book Indexed is an inexpensive, but rich source of speech inspiration.